SUBHEAD: Solar power couldn't run the conventional fridge, but converting a bin freezer worked. 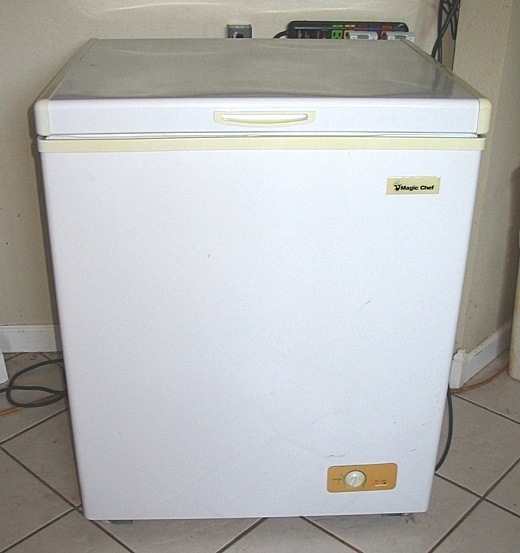 Image above: A typical low cost small bin freezer. From original article. \In the months before purchasing our solar kit, we took measurements of how much power each of our appliances pulls using a Kill A Watt Meter. After plugging our fridge into the meter for several days, we were able to determine that our upright unit was pulling about 2.25 kWh/day. With a solar system that will only produce 4-6 kW/day (assuming sunny days and clear skies), we had to find a way to reduce the load our fridge required. I did a lot of research online, reading solar forums to find out what other people were doing for refrigeration off the grid. Many people use propane or gas refrigerators, but we didn’t want to have to depend on buying fuels to keep a fridge running. Some people recommend solar refrigerators, but with the smallest models starting out at around $700, this option was way out of our price range. A more primitive alternative is using a Zeer Pot, but we really need something more practical than that for our everyday needs. 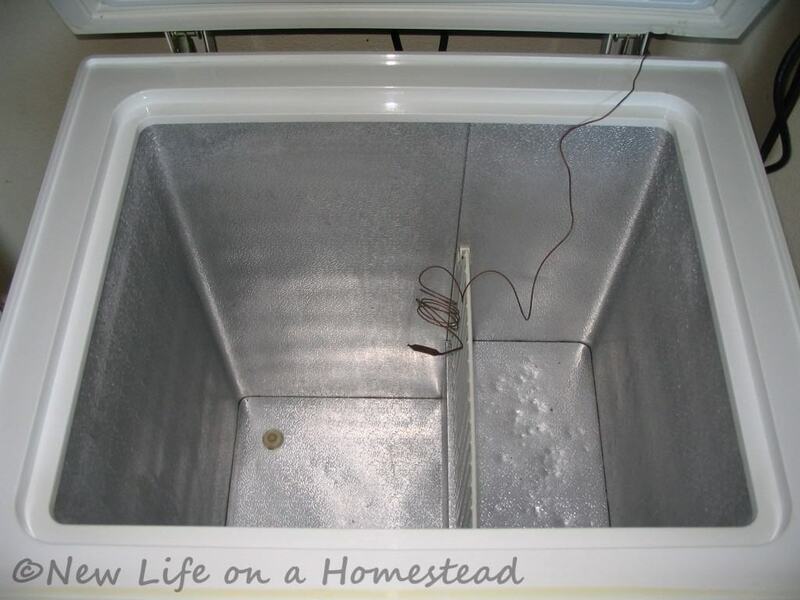 Converting a chest freezer… a regular ol’ chest freezer… into a super energy efficient fridge. Surely it would be complicated. There would be re-wiring and all sorts of complicated electrical modifications. Right? Actually, not at all. It’s as simple as an extra plug. But I’ll get to the technical stuff in a minute. One of the best things about a chest fridge is that they require just a fraction of the energy an upright model uses. Think about it. Cold air sinks. So when you open an upright fridge, all of that cold air you’ve paid to produce falls right out of the fridge at your feet, which in turn causes it to run more often. But with a chest fridge that cold air just sinks back down into the unit, requiring less energy to keep it cool. That’s why grocery stores like to use chest fridges. Even if you don’t have any plans for going off the grid, you might want to consider the benefits of replacing your upright fridge/freezer with chest units simply for the energy savings. Switching to a chest fridge isn’t for everyone. There are definite drawbacks to a system like this, which we’ll talk about later. But for us, it was a perfect and affordable option to use alongside our solar kit. When shopping for a chest freezer to convert to a fridge, find the smallest unit to accommodate your needs. Generally, the smaller the freezer the less energy it will require. We found a 6.8 cu. ft. Magic Chef freezer for $80 on Craigslist. It’ll fit an 8×13 casserole dish down in the bottom, so there’s plenty of room to store leftovers or make-ahead meals. Although this unit isn’t Energy Star rated, it was comparable. Before deciding on a purchase, do some research into how much energy it uses compared to other models of equal size. The amount of watts it uses as a freezer will be different from what it’ll use once converted to a fridge, but by comparing models you can at least get an idea of whether it uses more energy than necessary or if it’s pretty energy efficient from the get-go. To figure out how many watts a freezer pulls, you’ll need to use the formula: Amps x Volts = Watts. There should be a plate or sticker somewhere on the freezer that tells you how many amps and volts your freezer uses. 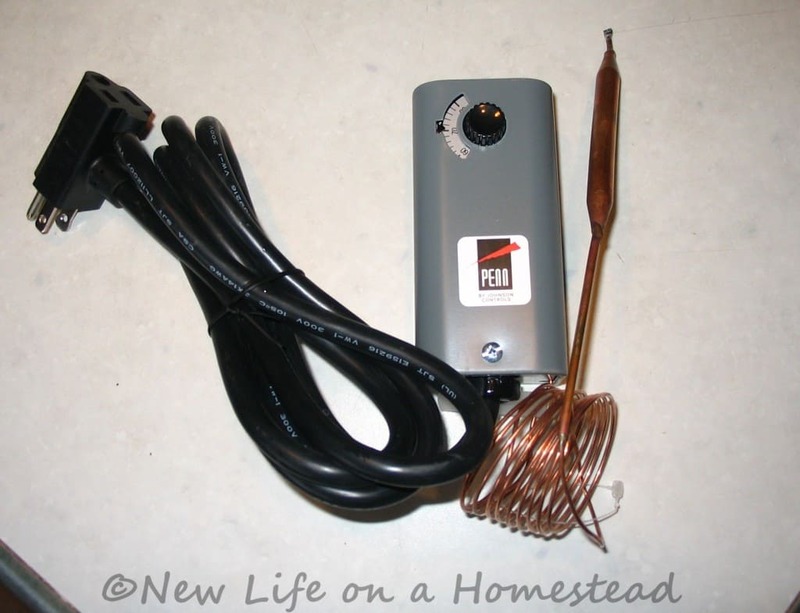 2.0 Amps x 115 V = 230 Watts, or .23 kW (1 kW = 1000 Watts). This tells us approximately how many watts the unit uses per hour. After converting the freezer to a fridge, our unit was pulling .68 kWh/day. Once we loaded it up with food the chest fridge is now reading about .51 kWh/day. That’s less than a quarter of the energy our upright fridge used! ask about the last time the freon was topped offscratch that, but do make sure there isn’t a leak in the line. Once you’ve found a chest freezer the next step is to convert it to a fridge. The easiest way to do that is to purchase a Johnson Controls Freezer Temperature Controller. We got ours for about $50 on Amazon. With this device, there is no re-wiring or complicated configuring whatsoever. It’s as simple as a plug. Plug your freezer into the controller. Plug the controller into the wall outlet. Set the thermostat on the controller to a good temperature for refrigeration (we’ve got ours on 32*). 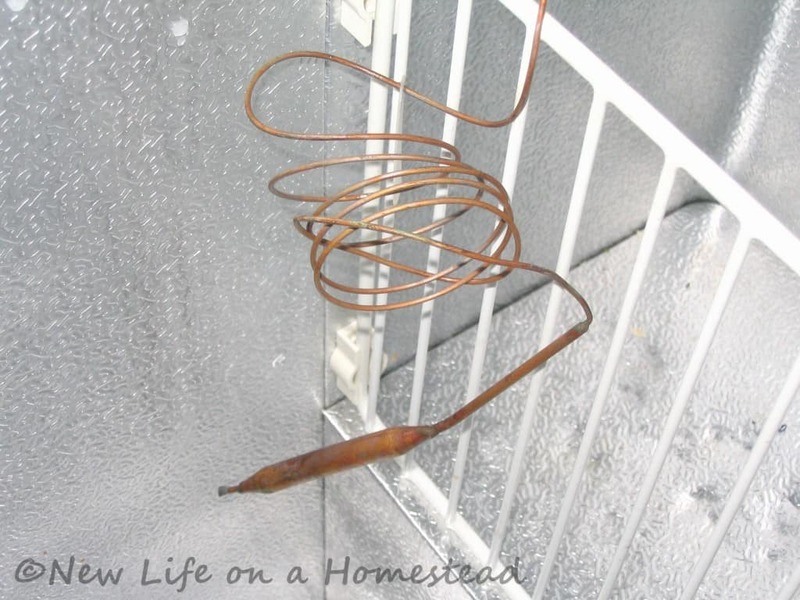 Place the copper prong in the freezer, feeding the copper wire underneath the lid. The temperature in the box will raise to the new thermostat’s setting, and your unit will automatically go from being a freezer to a fridge. Easy enough? We mounted the controller to the wall behind the chest fridge. You can see the copper wire leading into the fridge from the back side. It just slips right underneath the lid. 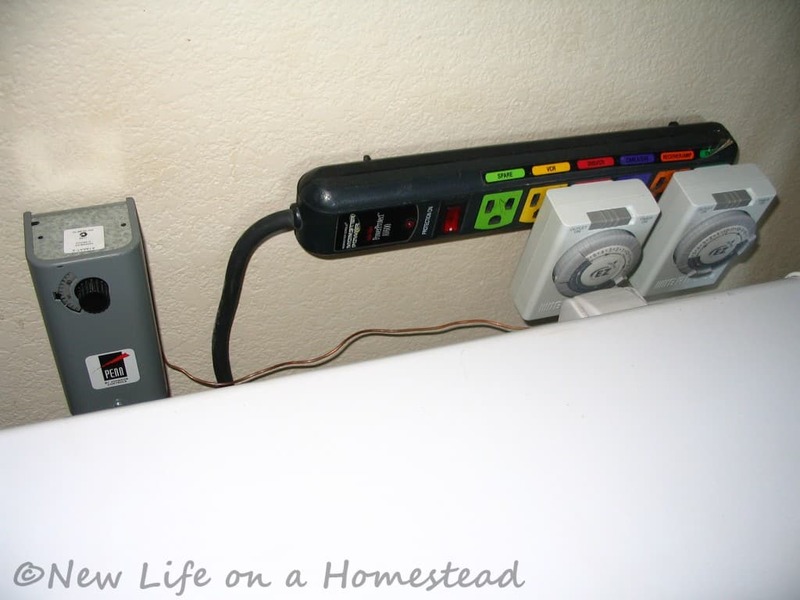 My husband also mounted a power strip with timers for our chest fridge and freezer, so we can control how often they come on when our solar is low on power. Here’s the inside of the fridge before it’s filled. You can see the copper wire and probe in the center of the fridge. We try to keep it hanging around the middle of the fridge to keep the temperature consistent. If the probe is closer to the top of the fridge, it may read warmer air causing the unit to cool down unnecessarily. I try to keep the prong from touching the wall of the fridge. Not sure if that matters, but it seems like a good idea. 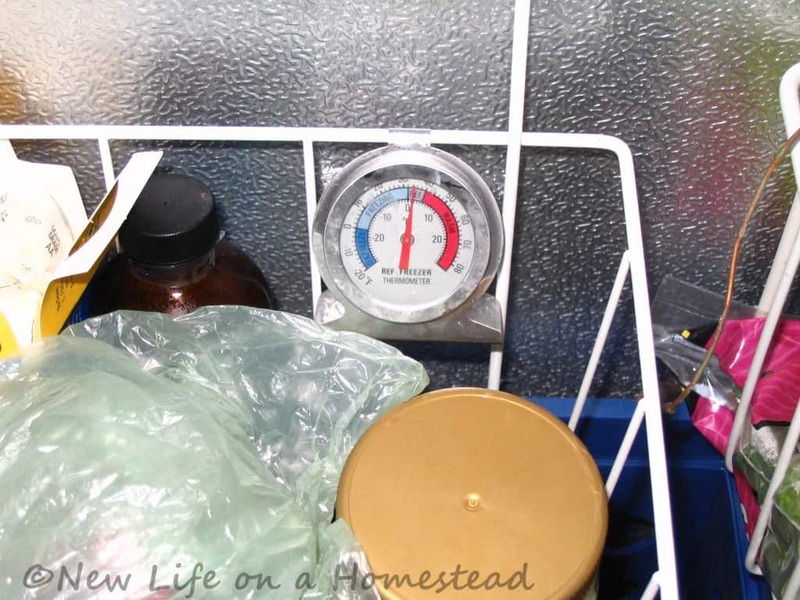 A refrigerator thermometer helps us make sure it’s staying at the right temperature. Once I had sufficiently emptied our upright fridge/freezer, I was ready to move what remained to the new solar powered chest fridge. I was shocked by how much space was being taken up in our fridge by stuff that didn’t even require refrigeration. 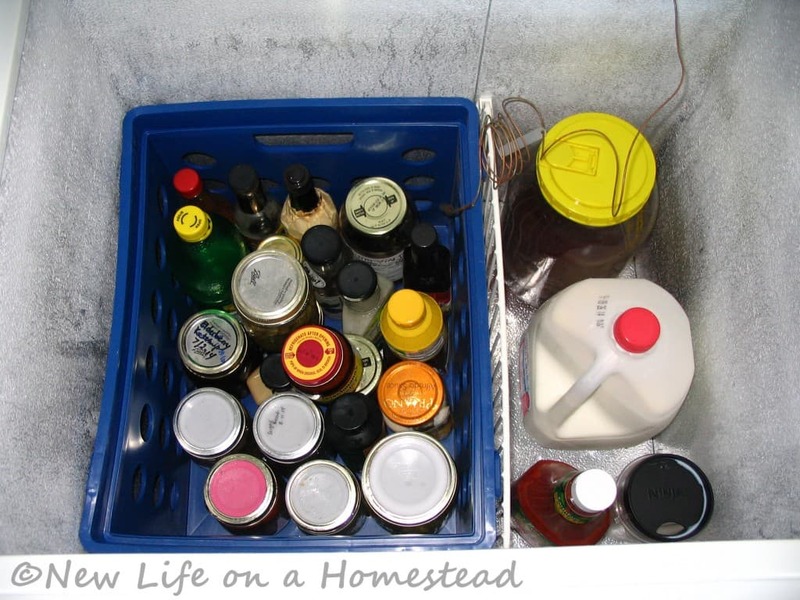 I’m still working my way through the condiments and canned goods (I had like six jellies open in the fridge… yikes! ), but when it comes down to the basics, we really only need the fridge for dairy products, a few condiments, leftovers, and more delicate produce such as leafy greens. Down in the bottom of the fridge I put a milk crate to hold condiments and things we don’t use that often. Over time, condensation builds up in the bottom of the fridge and it needs to be soaked up. Having all of the loose jars up out of the water and in one easy-to-remove container makes cleanup a little easier. I’ve used two freezer baskets to take advantage of the space at the top of the fridge. In these I put the stuff we use most often. I’ve found that having our leftovers right on top where they can’t get lost has really helped me use them up, where as before they would often get pushed to the back of the fridge and forgotten. Having two baskets is a good use of the space, but it isn’t as practical as I’d like. To get to anything below, we have to remove one of the baskets first. Ideally, we would just slide one basket to either side to reach the bottom. 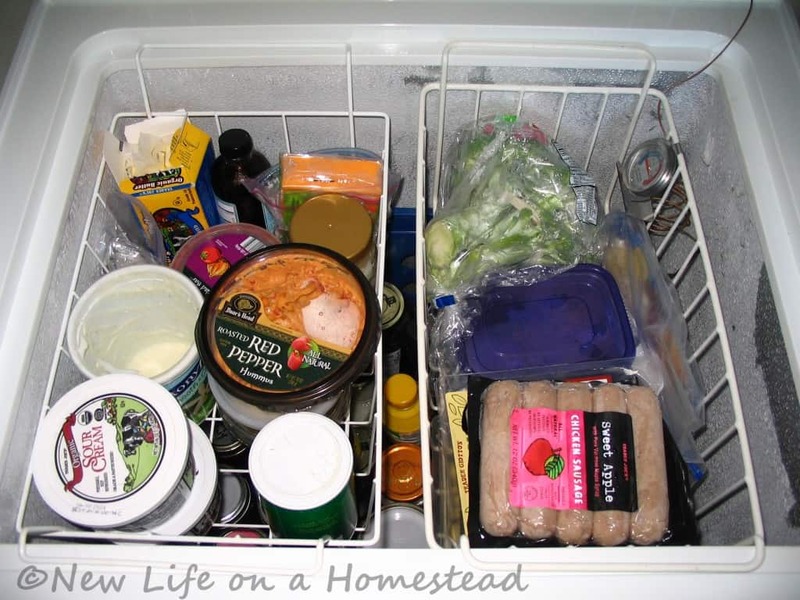 Frugal Kiwi has an excellent post on Organizing Your Chest Refrigerator, in which she shares some fantastic ideas for making the most of your space while still allowing access to the bottom of the fridge. I’d love to make shelves like her husband made, eventually. But what about a freezer? Yes, we still have a freezer. Instead of having an upright fridge/freezer AND a chest freezer (which is what we had before), we’ve consolidated all of our frozen foods into the one chest freezer. The chest freezer by itself pulls about 1kWh/day, which we can support with the solar panels alongside the chest fridge. Convenience– Obviously, having to move stuff to reach down into the fridge is a little less convenient than we’re used to. But honestly, it really hasn’t been too much trouble. Condensation– The fridge does accumulate water in the bottom from condensation. About once a week I pull everything out of the fridge and dry it up with a towel. No Instant Filtered Water– With our upright fridge, the kids were used to helping themselves to cold, filtered water straight from the fridge door. Now they have to get water from the kitchen faucet, ’cause it’s too far down for them to reach into the bottom of the fridge. I’d like to get a Berkey or other beverage dispenser to fill with ice water to keep on the kitchen counter so that it’s easier for the children to fill their cups whenever they need to. No Ice Maker– Of course, we don’t have an automatic ice maker now either, so it’s back to the old fashioned ice cube trays. Which works just fine. Space– Having a chest fridge and a chest freezer definitely requires more floor space than an upright model. This may be a deal breaker for you. We have chosen to be unconventional (imagine that!) and move our chest fridge and freezer into the master bathroom, which is on the north side of the house and stays the coolest. With a little adjusting it really hasn’t been difficult to get over these minor inconveniences. In our opinion, it has definitely been worth the trade. The total setup cost to us was about $130 for a fridge that now runs on solar power, which we quickly made back by selling our upright fridge. Your cost will depend on the deal you can find on a chest freezer, plus about $50 for the thermostat controller. Refrigerators generally don’t cost that much to run for a year, especially newer more efficient models. But when your power is limited and every watt adds up in a big way, converting a chest freezer to a fridge is a great way to significantly reduce your household energy load.